Italian chiaroscuro woodcut paintings were arguably the most technically innovative of the Renaissance color paintings. Carved wood was used to print the image onto dark canvasses; creating a high-contract image with one main light source. The most famous of the masters for their take on chiaroscuro were Leonardi da Vinci, and Rembrandt. John Asmus and Vadim Parfenov developed an analytical tool, which digitizes images of paintings and provides computational data based on the luminosity of the image; driving a histogram. A histogram is an accurate representation of the distribution of numerical data, and in this case, a histogram is what photographers use to analyze the tonal values within the image. As a modern-day form of chiaroscuro, key-light (or low key) photography also presents itself with one main light source, and high contrast on the histogram; very high highlights, and very high shadows. I often look back on my old shoots, and realize that I have forgotten how to shoot key-light photos. The settings on the camera, flash and transmitters seem to elude me. Never-the-less, I have shot dozens of them, but if I don’t shoot them often; they slip in to the endless bank of forgotten useless facts that float around in my head. I consider this a post that will not only guide others on how to shoot a low key photo, but also as a reminder for myself, so that I don’t have to “reinvent the wheel”. My approach to a low key photo is to use a flash with high speed sync (HSS) and a fast camera shutter of 1/4000 to 1/800. Low key photography is accomplished when a speed-light/flash is used to light up the subject and at the same time, the shutter speed is set so fast that it is faster than the flash of light itself. This leaves a dark background and illuminated subject, which brings contrast, interest and enhancing textures to the subject as the light wraps around key elements that are closest to the camera lens. The effect leaves a contrast and histogram similar to those found in Asmus and Parfenov’s analysis of Rembrandt’s self-portraits. Note: I use several Yongnuo YN568EX, flashes. A good set of HSS enabled hot shoe mounted controller and receivers. The controller mounts on your hot shoe, and allows for acute control of multiple flashes with through the lens (TTL) metering capabilities, as well as HSS. The transceivers mount to the bottom of your flash and receive the information which is sent from the controller. You will however; need one transceiver for every flash that you use. A dimmer/darker room is preferred for more control over lighting, but it can also be shot outside in full sun with a camera that can facilitate a shutter speed of 1/4000 of a second or faster. My old d800 was a legend with 1/8000 – don’t get me wrong, I love my DF and manage with 1/4000 just fine. 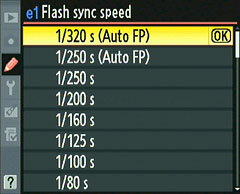 Begin by changing your flash settings on your camera’s flash sync speed to 1/320 s (Auto FP). This will allow your flash to be faster than a shutter speed greater than 1/320. Without this setting, your flash will not sync as fast as your shutter speed, and you may see the infamous “black curtain” in your photographs (you will see the camera’s shutter in front of the subject, instead of the subject in its entirety). Set your on-camera flash or your wireless controller to full power or 1/1. Set your ISO as low as possible, set your shutter speed as high as possible and open your aperture up as wide as possible. This will allow for the fastest speeds – without getting grainy pictures. Take your shot – it will most likely be over exposed. You will have to lower your flash power initially, and also close up your aperture one stop at a time, until you get your desired result. In the image below, I used the Yongnuo transceivers to trigger highly diffused studio strobes. One special reminder is that no matter what your settings are, the magic is in composition and subject. The more interesting and original, the better. I’d love to see your results. Please share with your photo junkie friends and submit some of your low key experiments! Asmus, J., & Vadim, P. (2018). Characterization of Rembrandt self-portraits through digital-chiaroscuro statistics. Journal of Cultural Heritage, 1-7. Morenus, L. S., Eng, C. W., Takahatake, N., & Rambaldi, D. C. (2015). 16TH AND 16TH CENTURY ITALIAN CHIAROSCURO WOODCUTS: INSTRUMENTAL ANALYSIS, DEGRADATION, AND CONSERVATION. Journal of the American Institute for Conservation, 238-271.